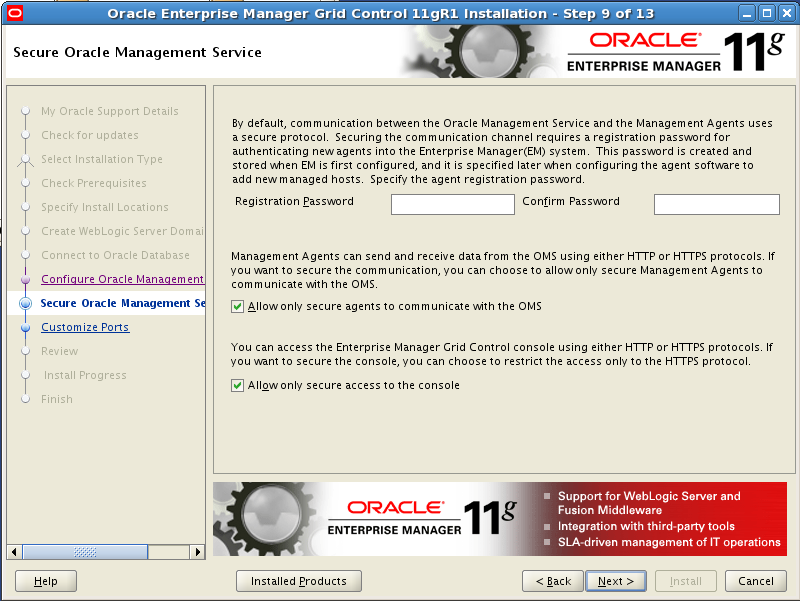 Oracle WebLogic Server 10.3.2 is required to be installed on the host in which you are going to install Enterprise Manager Grid Control. 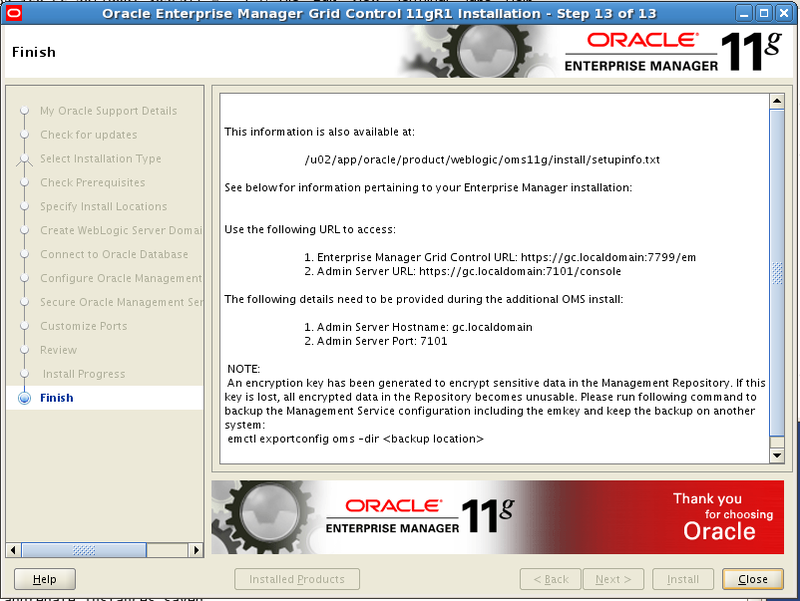 See the post Installing Oracle Weblogic Server 11g Release 1 (10.3.3) on Linux if you do not already have WebLogic Server installed. Note you cannot use Oracle Weblogic SOA Suite for Grid Control. Note: The documentation states that Weblogic 10.3.2 or higher can be used but you may run into problems using using Weblogic Server 10.3.3 or higher. See Oracle Support Note: 1135493.1. The Oracle Database for the repository needs to be Oracle Database 10gR2 (10.2.0.4) or higher. The UNDO table space must have at least 200MB allocated at the time of install. The parameter SESSION_CACHED_CURSORS must be 200 or greater and the parameter PROCESSES must be 500 or greater. 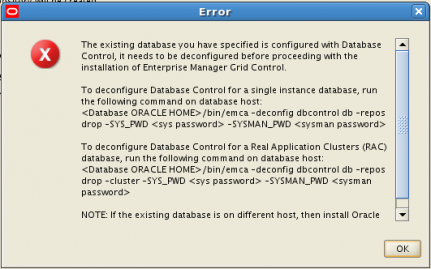 If these parameters along with the UNDO table space size are not set at the time of installation they will produce errors on Step 7 Connect to Oracle Database. If the database was created with Database Control enabled you will need to remove the Database Control repository. To start the installation process execute the runInstaller script. 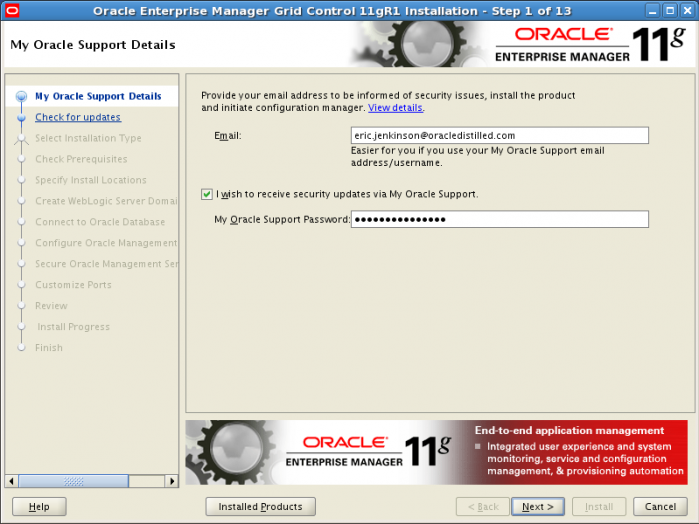 Enter your My Oracle Support user name and password to set up security update notification and initiate configuration manager. This information is option. Click the Next button to continue. It is possible to install patches/updates during the installation process. If you choose to apply patches/updates you can either get them on demand using your My Oracle Support login credentials or you can download the patches/updates prior to installation and store them in a central location. After making your choices click the Next button to continue. You can either install a new Enterprise Manager system or add an addition management server. Both install options require an existing certified Oracle WebLogic server. 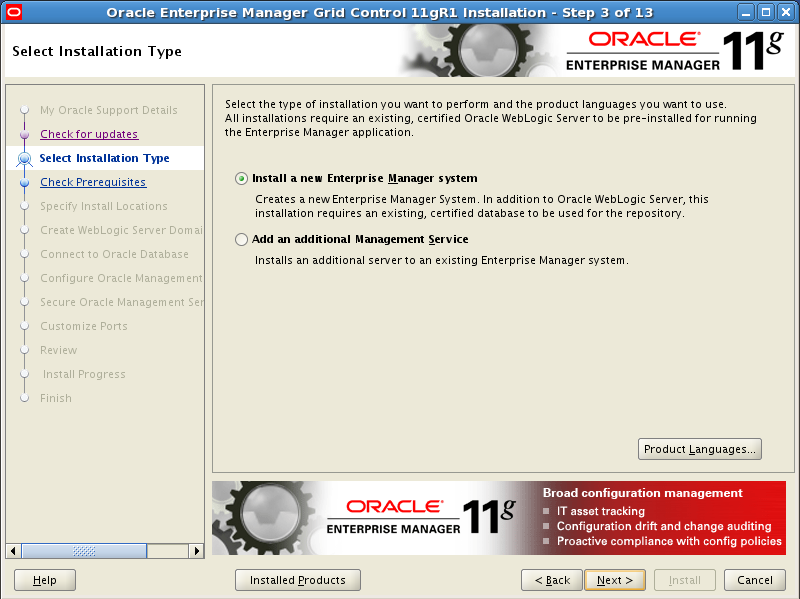 For this document we are going to install a new Enterprise Manager system. Click the Next button to continue. 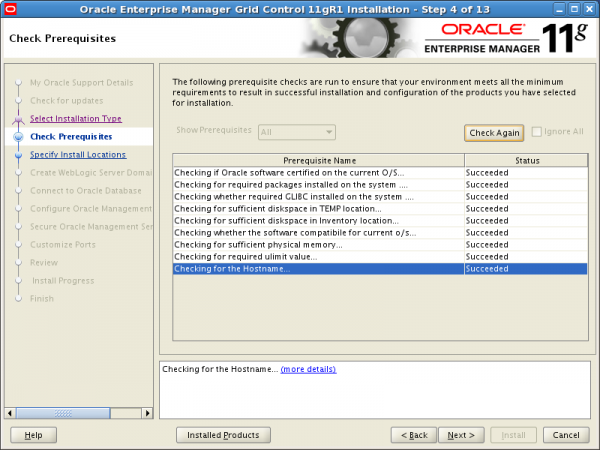 Next are the standard prerequisite checks that are common with Oracle software installs. Click the Next button to continue. 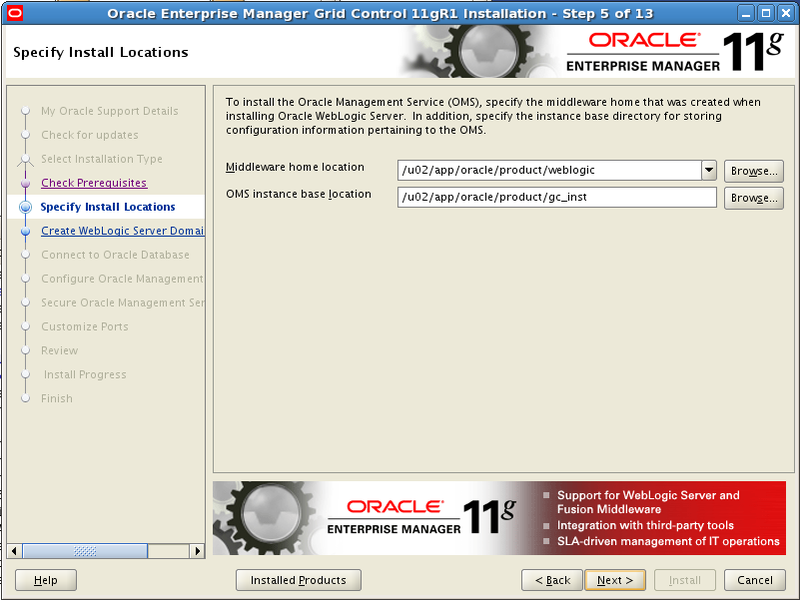 The installer should pickup the location of the middleware home that was used for the installation of Oracle WebLogic Server. 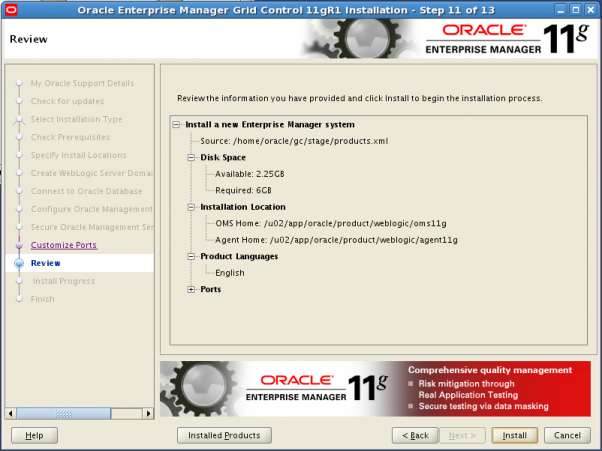 If the installer does not find middleware home either type in or browse to the location that contains the Oracle WebLogic Server. You can also provide another location for the Oracle Management Service. Click the Next button to continue. The installation process will create a WebLogic domain called GCDomain all that we need to provide is the password. Click the Next button to continue. Now we need to provide the install the connection information for the database to be used as the repository. Provide the hostname, port, SID and SYS password for the database you are going to use for the Grid Control Repository. Click the Next button to continue. Three table spaces are created to house the Enterprise Manager Grid Control repository. You can either accept the defaults for the data files or provide names that match your naming scheme. You also need to provide a password for the SYSMAN user. Enter the password to be used to secure the communications between the agents and management service. You can also choose to only allow secure agents to communicate with the repository and to only allow secure access to the console. Both are set by default. 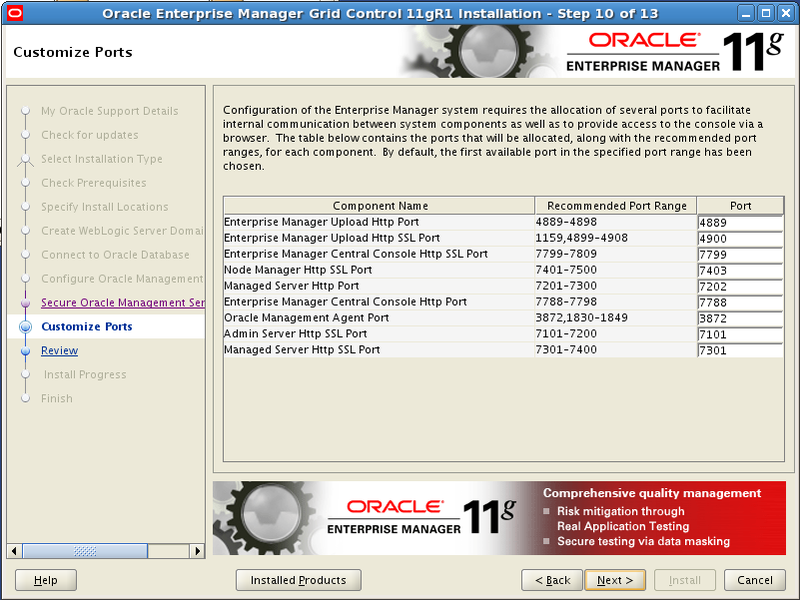 You have the ability to customize the ports used by Enterprise Manager to fit in your environment. Click the Next button to continue. The Review screen is your last chance to make any changes to previous steps before starting the installation. 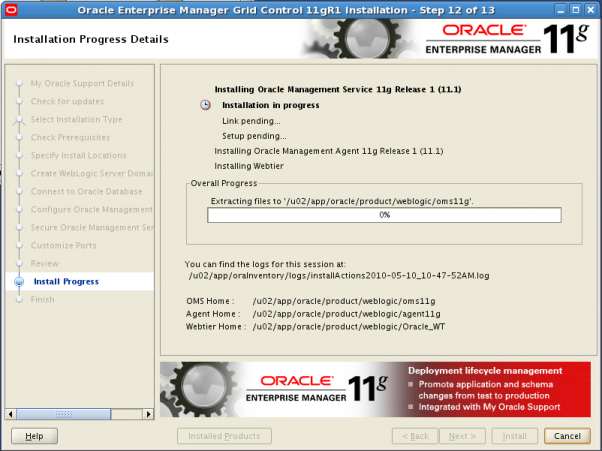 Click the Install button to start the installation. 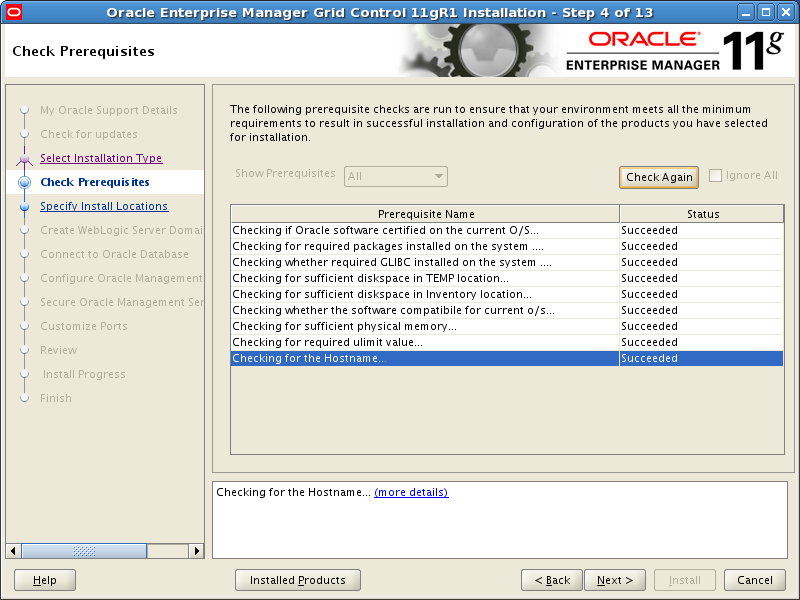 Installation steps and progress are displayed on the Install Progress screen. 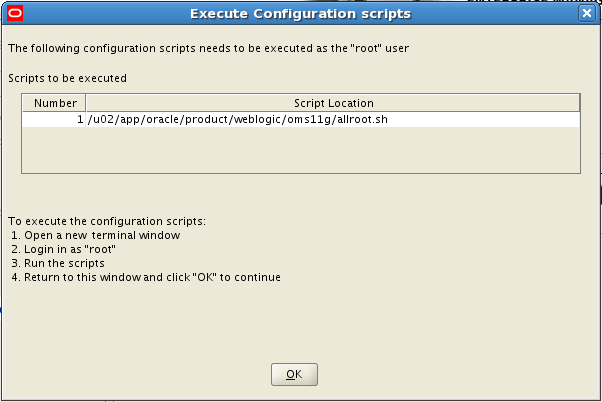 At the end of the installation you will be asked to run a configuration script as the root user. 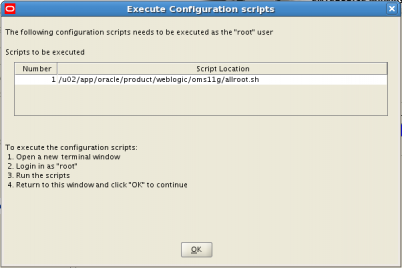 In a terminal session connect as the root user and run MW_HOME/weblogic/oms11g/allroot.sh. Note I chose not to overwrite any files. After the scripts are complete click the OK button to continue. Next several configuration assistants will be executed. After the entire configuration is complete you will get the Finish dialog that will detail the installation and provide the URL to access Enterprise Manager Grid Control. 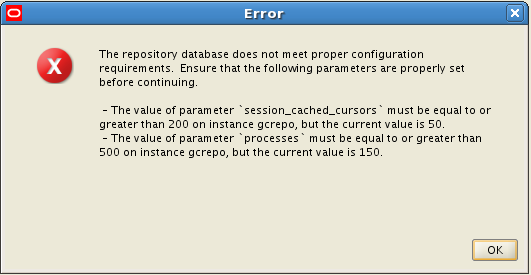 If the database you are going to use as a repository is configured with Database Control you will receive an error message like the one below. If you do get this error, click the OK button to dismiss the error and open another terminal session and run the $ORACLE_HOME/bin/emca – deconfig dbcontrol db command. Note: If your repository database is in a RAC cluster you will need to add –cluster after –repos drop. INFO: This operation is being logged at /u02/app/oracle/cfgtoollogs/emca/gcrepo/emca_2010_05_10_10_57_12.log. 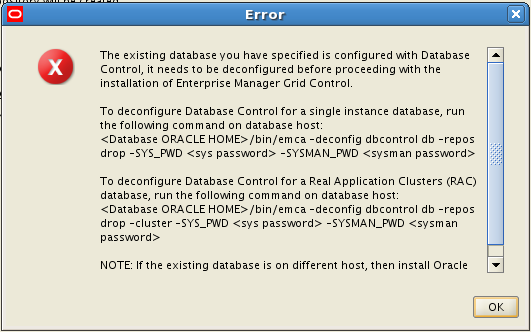 After removing database control from the database you may receive another error such as the one below. The database to be used as the Grid Control repository needs to have the parameters SESSION_CACHED_CURSORS set to 200 or greater and PROCESSES set to 500 or greater. Setting these parameters will require the database to be bounced in order for the changes to take effect. Click the OK button to dismiss the error and connect to the database to change the parameters. If the UNDO table space does not have 200MB or more already allocated you could receive the error below. Click the OK button to dismiss the error and resize the data file associated with the undo table space to 200MB or more. Doesn’t work with 10.3.3 or 10.3.4. Use 10.3.2 works fine. Thank you for the update. What problems did you encounter when using Weblogic 10.3.3 or 10.3.4? I had the same problem as Robin. See metalink doc 1135493.1. Thanks for all the other great info though. Thank you for the Metalink note. 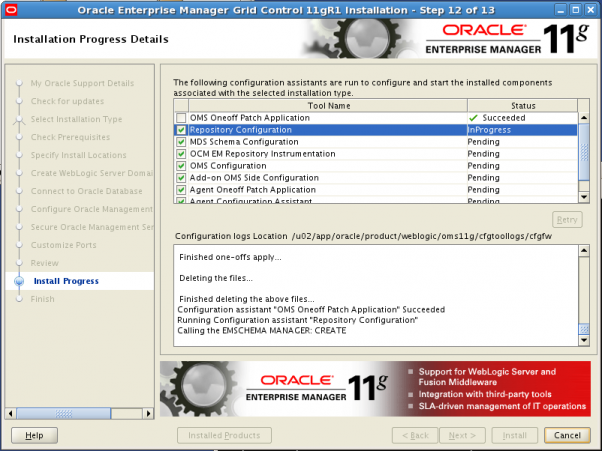 I will update both Grid Control install post and the Weblogic install post with a note about the problems using Weblogic 10.3.3 or higher.